A different type of outfit post, since I'm still (ugh) struggling to juggle the blog, a full time job, a household and my social life. Here are some snaps of my outfit that my boyfriend took in between and that I uploaded on my Instagram-account. Apart from the last couple of days, the weather has been good to us in Belgium. It has been raining cats and dogs now, but the sun should come out again this weekend -- which is great news, since I'll be attending Tomorrowland this Friday. Who else will be there? My mind has been going overdrive on which outfit to wear, though. I still haven't decided, so a little help is always appreciated. Tell me, what's your favorite go to outfit for a festival? Aaah, festival season is upon us and I couldn't be happier! Belgium might be a pin sized country on the globe, but it hosts some of the best and most famous festivals in the world. Next to Extrema Outdoor and Werchter Classic (Guns N' Roses, here I come! #dream), I'll also finally attend Tomorrowland again. It took us 14 PC's, laptops, tablets and smartphones (and a lot of stress too), but my boyfriend managed to get us tickets for the second Friday, yay! I attended Tomorrowland once in 2009, way before it was such a worldwide phenomenon, and was able to get my tickets at a local music store. Man, how things can change so quickly! That aside, I'm very proud that people from all over the world unite in "my Belgium" for two magical weekends in a row. And I'm so happy that I get to experience it myself again. Anyway, the hunt for the perfect festival outfits has started and I might not have to search too long for my Tomorrowland outfit: meet the TML by Tomorrowland collection! They just launched their 'Embrace The Journey' collection and even though it's an independent fashion label, their link with the Tomorrowland festival is undeniable. From T-shirts to caps and sunglasses to jewelry; find it all in one of the 30 stores in Belgium and the Netherlands or go to the Tomorrowland store to shop your favorite item. You can find my absolute favorites after the jump. Any readers that I might bump into? Only two months left! 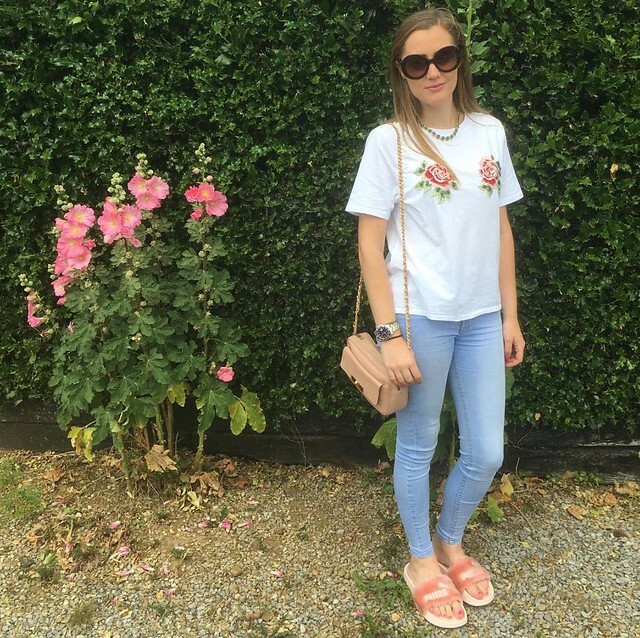 Hi guys, I just wanted to give you a short update on my two latest additions to my closet and my favorite trend for spring and summer. During a shopping spree at Zara, I came home with two new pair of shoes. #SorryNotSorry Can I also give a shoutout to the best boyfriend in the world -- which is mine -- for letting me shop without pointing out the amount of shoes that are already in my closet? I love you, babe. After taking this picture, I realized that there was a third pair that I got at Zara (again, #SorryNotSorry) and I forgot to photograph; you can see and shop them here. I've been wearing espadrilles for as long as I can remember and apart of the fact that they are super comfy, I also love that are made out of leather. 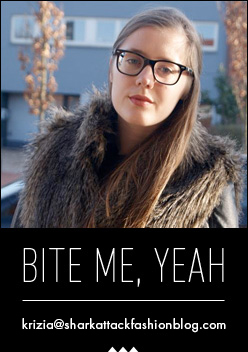 It gives them that extra edgy vibe. If you're a longtime follower of the blog, you know I love myself some leather goodies. 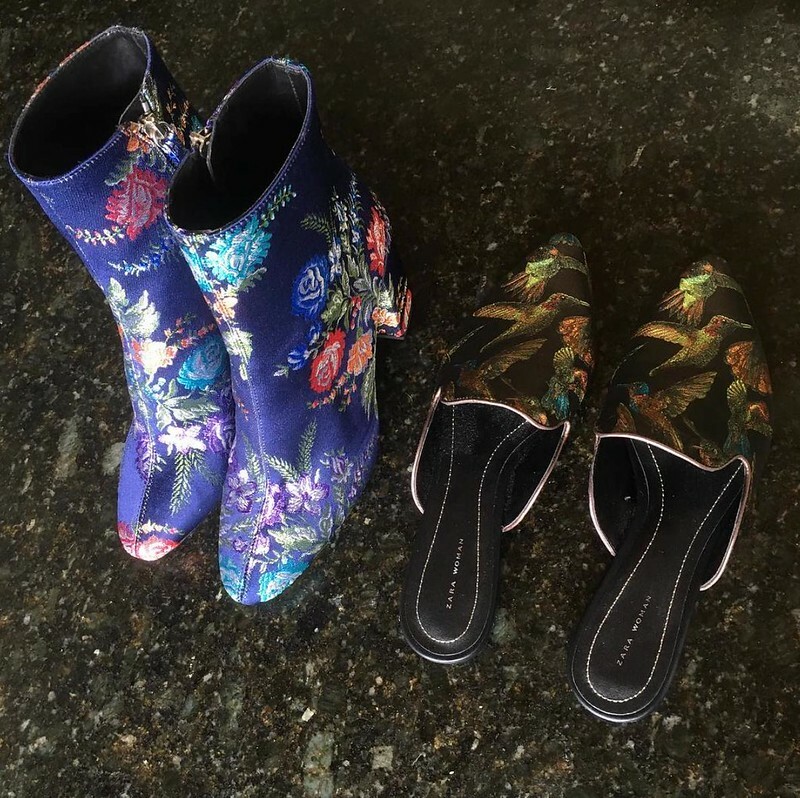 The flower printed ankle booties were on my wish list for quite a while, but they seemed to be missing from every Zara store I visited. I even ordered my aunt and boyfriend to look for them in the Netherlands, without any result. Didn't I tell you that I have the best boyfriend in the world? Anyway, I had already given up on them when I entered the Zara-store in Düsseldorf and they were the first thing I saw. I already wore them with an all black outfit, but I can't wait to combine them with a casual white shirt and a pair of black skinny jeans. As for the tropical printed babouche slippers on the right: they're the ultimate love or hate thing. If I had a say in it, I would choose them as my favorite trend for this spring and summer. They're casual but edgy and the options on how to wear them are endless. Plus, don't we all love a romantic, Arab, Aladdin vibe? I spotted this pair and tried them on at the Zara in Maastricht, but didn't get them because my sister kept telling me how much she hated them. When I was laying in bed, all I could think was: since when do I listen to other people's opinion? It literally felt as if I neglected my morals and values. *Insert dramatic tune here* So the next day, I asked my boyfriend to take me to Maastricht again (best boyfriend) and the shoes and I lived happily ever after. I also spotted another pair of babouche slippers, this time by Jeffrey Campbell, but they are sold out everywhere! #Cries They're called the Sarika-Emb flats and they're so Dolce & Gabbana. Most people will think they're too much, but I think they're the coolest. I already subscribed myself to receive an email when they're going to be restocked, so fingers crossed! What are your thoughts on them? Say farewell to your out-of-bed-face: Clinique has created a whole range of skincare products to get your face ready for the day. 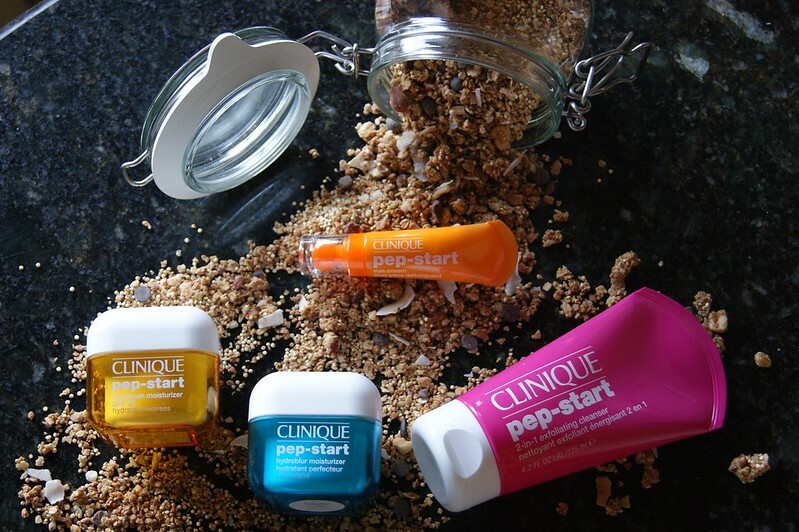 The Clinique Pep-Start collection contains a cleanser, a moisturizer, a day cream and an eye cream. My skin is quite dramatic; always has been and always will be. Clinique's products are all allergy tested and are 100% fragrance free, which is a huge plus for my sensitive skin. Did you know that their final products are tested 12 times on 600 people? If one of those 7200 people gets an allergic reaction, Clinique re-evaluates the product and its formula, until they have reached perfection. I don't think that I need to explain myself on why my bathroom shelves are dominated by Clinique products, now do I? The whole Pep-Start routine takes up a maximum of 5 minutes, making it the perfect skincare routine for those who don't have a lot of time in the morning. Curious to find out more? Keep on reading after the jump! * The Clinique Pep-Start 2-in-1 Cleanser (125 ml) sells for € 20,15. * The Clinique Pep-Start Hydrorush Moisturizer SPF 20 sells for € 22,75 (30 ml) or € 31 (50 ml). * The Clinique Pep-Start Hydroblur Moisturizer sells for € 22,75 (30 ml) or € 31 (50 ml). * The Clinique Pep-Start Eye Cream (15 ml) sells for € 26,79.